While some sweating is normal, excessive sweating can be a problem - especially for menopausal women. Sweating in menopausal women is usually the result of hot flashes. Hot flashes occur when estrogen levels dip, giving the hypothalamus insufficient stimuli. This can make the brain confused about the body's internal temperature, and cause it to warm itself up. When it realizes that its overheating, it tries to cool down by sweating. When hot flashes occur at night, they're called night sweats, because the resulting sweat often soaks though clothing and bed sheets. Maintain a cool environment. Open windows, turn on a fan or air conditioning. Wear light and breathable clothing. Certain fabrics (cotton, linen, silk) are more breathable than others (polyester, nylon, spandex) and can help your body maintain a comfortable temperature throughout the day. Dress in layers. Wearing layers can make it easy to shed if you start overheating, or add layers when cold, regulating body temperature. Keep a bottle of water on hand. Whether an ice pack, water, or even ice cream, keeping something cold on hand can help regulate body temperature. Eat healthy. Hot flashes are caused by hormonal imbalance leading to confusion of the body temperature, so eating the right kind of food and making sure you get all your necessary vitamins and nutrients to stimulate hormone production is essential. Alternative medicine. There are a variety of types of alternative medicines that may help you control hot flashes and night sweats. Some herbal remedies containing phytoestrogenic and non-estrogenic herbs may be able to help stimulate hormone production or mimic hormones in the body. Other options involve things like acupuncture, which many women claim works well for reducing hot flashes. When choosing whether or not to try alternative medicines, always make sure to read up on the medicine to make sure it doesn't have side effects or negative interactions with medicines you are currently taking. 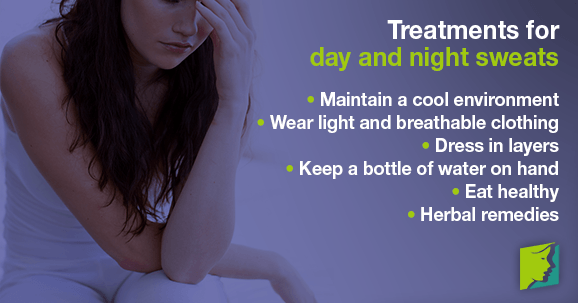 If you are ever concerned about your health because of hot flashes and night sweats, talk to your doctor. There are a number of other procedures that can be done to reduce menopausal symptoms, and you can discuss the risks and benefits of them with a medical practitioner. For more information on night sweats and hot flashes please click the following link. Von Muhlen, DG, et al. "A community-based study of menopause symptoms and estrogen replacement in older women". Maturitas. Sept 1995; 22(2):71-8. Night Sweats: When Will the Nightmare End? Q&A: What Are the Differences Between Night Sweats and Hot Flashes? Should I Consult My Doctor about Sweating at Night? Find ways of treating night sweating episodes with simple lifestyle adjustments that mean you can enjoy restful, sweat-free sleep without having to consult your doctor. Menopause is often accompanied by high blood pressure and night sweats. Read on for more information about these menopause symptoms.